Motivation Letter for EU - What is Motivation Letter? How to write it? 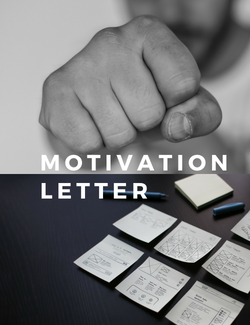 Motivation Letter: How do You Make the Right One? Several universities across Europe, which offer a Masters degree to aspiring international students, request the applicants to send in several documents at the start of the admission procedure. Some of these are the academic transcripts, language proficiency tests, CV and one of the most popular documents nowadays that can make or break your admission - a motivation letter. A motivation letter is one in which you get the opportunity to give the admission faculty a chance to understand you better and know what shaped you into the individual that you have finally become. You give them some valuable and unique aspects of your personality that convince them that you are the right person for the course. Think about it, a motivation letter is an extremely important document in your admission process. Your marks and grades can be exact as a few other students, that is not a measure of your individuality. However, a well-written motivation letter can help you overcome this disadvantage. Think this letter through and spend enough time carving out a crisp and precise motivation letter, so that not only do you come across as a mature and focused individual, but also help the admissions team connect with you on a personal basis; not all of them might, but some may be reminded of a younger version of themselves that will draw them towards choosing you to be a student at the esteemed institution. Dear Sir/Madam - Addressing in a proper manner. Do not write "to whoever it may concern". It makes the reader feel welcome. Explaining what you are applying for - Start to introduce yourself by mentioning what course you are interested in. Thank the reader for giving the time of the day to read your letter - The reader is probably reading a number of letters in a day and your's is one of them. Show them that you are thankful to them for reading your letter. Stating "Thank you in advance for reading my letter" OR "Thank you in advance for taking the time to read my letter" are some good ways to do just that. Explain how the university and the program will help progress your career - Explain why you chose this particular university. Writing general remarks that "I am choosing this University because it's one of the best" is NOT a good way to explain that. Research about the university and explain the unique ways in which it stands out. Also explain why the program appeals to you and why you think it will help you shape your career. Details about your undergraduate degree - Write about your Undergraduate degree now. What are the skills you've acquired that are applicable to the program you're applying for. How will your Undergraduate degree compliment the Masters degree you are applying for. Details about your work experience - Time to explain the work experience you might have or the internships you might have taken. Explain your role in detail and how you worked to sharpen your skills during that time. Explain it's significance in your future degree. Extra-curricular things - Mention your extra-curricular activities and your achievements and their significance to your career, if applicable. If you are a basket ball champ representing your undergraduate college, you might mention it gave you a sense of working in a team. Showing understanding of the challenges of the program - Very important is explaining how you would meet the challenges of the program. Mention your strengths and how you can use them to be successful in the program you're applying for. Repeating thanks - Although you already thanked the reader in the beginning, it's polite to thank them again for their time. The reader should feel that you appreciate their efforts to evaluate your letter. 1. Your letter must convince the admissions team as to why they must choose you for the course. State your love for the subject, what motivates and inspires you to look forward to it and any on-the-field opportunities that you were a part of. 2. Always focus on your strengths and try not to mention your weaknesses as the faculty tends to question you more on them. So avoid writing down your weak points if you don’t want to find yourself in a tight spot. 3. Explain why you are a different person compared to most of the other students that you are likely to find enrolling themselves for the course that you are applying for. The letter must be strong enough to attract positive attention. 4. Your motivation letter must clearly state what your future goals are and they must complement the course that you are seeking admission into. For example, if you are enrolling for an MBA, please don’t mention how you wish to become a painter 5 years down the line. 5. While you must mention tiny, but unique aspects of your personality, the motivation letter shouldn’t come across as a lengthy essay that will put the readers off to sleep. Make it precise and strong. 6. Collect important information about the university and some of the achievements in the past and how these things have inspired you to enroll for your desired course at that specific university. 7. The overall tone of your letter should be positive and energetic. The readers must feel inspired to a certain extent after they read your motivation letter. 1. Don't start your letter by introducing yourself by mentioning your name. You will be mentioning your name at the end of the letter, besides your name does nothing to tell the reader anything about you. 2. Don't write your letter in a hurry. The readers are experienced people who can easily distinguish between a well though-of and planned letter and a haphazard one. Being in the latter category won’t help you. 3. Don't write boring stories that are extremely common. Not only does it show that you are not deeply motivated enough, but it also reveals a lazy aspect of your personality. 4. Don't exaggerate and mention unnecessary and repetitive information in your motivation letter. 5. Your motivation letter must not be a replication of your CV. They are two different documents for a very specific reason. One gives your educational background and the other can be a more personal and interesting journey through your life. 6. Your letter cannot be mundane and filled with jargon. The letter needs to be concrete and crisp without making it difficult for the readers to understand your basic message: What motivates you every day of your life? Several universities also ask for a personal statement along with other documents and transcripts. You must not confuse the two at all. A personal statement is generally about your past and the experiences that have made you the person that you are. You get a chance to talk more about who you are and this is your chance to be more honest and open about yourself. While, just like in a motivation letter, you are expected to mention your plans and motivation, you cannot place too much emphasis on them in this document as it is more about you. This is also the more creative document among the two that allows you to get as creative as you want. However, don’t get carried away and make it sound too far-fetched. When it comes to a motivation letter, you still do throw light on your past experiences, but this letter is more focused on your future goals and what you plan on doing with the degree that you are planning on getting. You are explaining why you decided to opt for that specific course and why you should be chosen. While the personal statement is more introductory in nature, this document is more target oriented. In both the motivation letter and personal statement you are expected to give more information about yourself; something that couldn’t fit into your CV. However, just like we mentioned above, the two are completely different documents and you should never substitute one for the other.